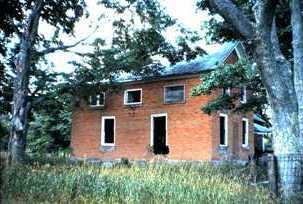 The Bowen house is located on lot 16 of the Third Concession of Lansdowne in Leeds & 1000 Islands Township. The land was originally granted by the Crown to Lovell Beach in 1803. However, in 1815, Israel Bowen purchased all 200 acres from Mr. Beach for approximately 56 Pounds. Over time, the land was severed off to other Bowen family members as well as to newcomers to the area. Today the property is owned by Chris Smith. 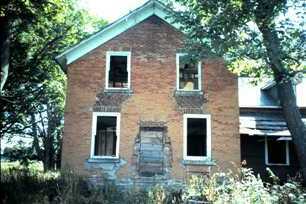 The house is terribly dilapidated and has been stripped of all interior contents. Some of the walls of the home have been vandalized and the original bricks stolen. The walls are three bricks thick. The bricks are of particular interest because they were thought to have been made on the property. It is believed that in the field closest to Fairfax Road there once existed a site where the bricks were manufactured. The bricks are a yellowish/orange colour. It is also interesting to note that there stands a house on Union Road that has been manufactured from the same bricks. Eric Webster's mother, Gertrude Bowen Webster was born and raised in the Bowen house. Gertrude's parents were William Nelson Bowen (1860-1956) and Martha (McMullen) Bowen (1866-1953). Nelson and Martha had t.hree children Gertrude, Ruby (who later married Clarence Eligh) and Ford, a son who died at a very young age. Gertrude Bowen married Wilfred John Webster. Wilfred John Webster's parents were Robert John Webster and Louisa McCullough. Wilfred's grandparents were John B. Webster (1828-1904) and Frances Foley (1824-1916). Nelson Bowen (Gertrude's father) was the son of Israel J. Bowen (1825-1892) and Elizabeth McConnell (1838-1877). israel Bowen was the son of John Lamb Bowen (1790-1862) and Mary Neil (1792-1846). John Lamb Bowen was the son of Israel Bowen (1748-184?). Originally the land consisted of 200 acres. But eventually the Bowens were in possession of 100 acres. 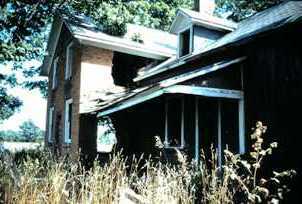 The house has been vacant since either 1939 or 1940. John "WES" Burns was the last to live there and he had lived there for about 20 years. Post 1940 Eric Webster and his family only used the house during the summer when they were drawing hay. The house was furnished with a few articles as well as dishes, a table and chairs. 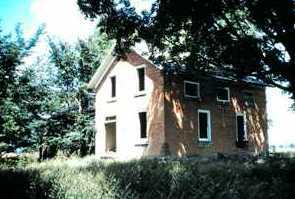 The Websters would have lunch and sometimes supper at the house during a day of haying. Gertrude Bowen Webster was a poet. Eric Webster has several collections of her writings, in book form as well as newspaper clippings. Her writings are passionate and yet simple. Her works also appear to be very personal; topics of everyday life. Mr. Webster has the original deeds for the land, several photographs, a very detailed family tree with accompanying pictures, and several newspaper articles about family members. See side panel to view Land Documents for this property. Mr. Webster also noted that there once was a saw mill on the property. When he took over the land he found several large logs and signs of a saw mill once being present. Any additional information about this sawmill would be greatly appreciated by the Historical Society. Clare Landon's grandparents, Oscar and Nancy (Webster) Landon were friends with Nelson and Martha Bowen. Oscar Landon was Fair President and Reeve of Lansdowne at one time. Reece Webster (a first cousin of Nancy Webster) was Manager of the Lansdowne Telephone Company at one time. Byron Landon (Clare's brother) is married to Martha Landon.